5 Hamster Breeds – Which One’s Right for You? Can Hamster Diseases Be Transmitted to Humans? Do Syrian Hamsters Carry Diseases? Do Hamsters Make Good Pets? Are Hamsters Dangerous for Children? 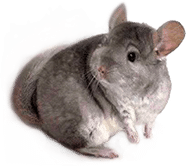 If you want to find out what the best hamster bedding for odor is, you have come to the right place. By analyzing the benefits, quality and customer reviews, Dr. Fox came to the conclusion that the Vitakraft Fresh is the option to consider. This product can absorb three times in weight in liquids and will maintain your pet’s habitat and your home smelling fresh for up to 14 days. It is made from 100% paper fibers with no chemicals involved, and it is also 99.5% dust free. 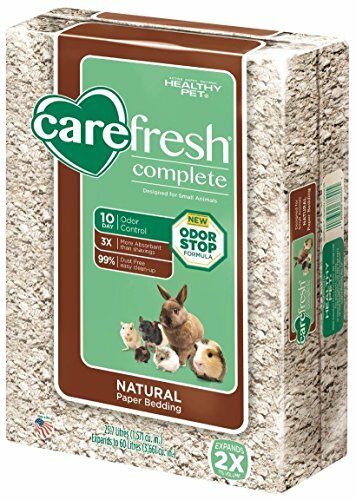 In case you cannot find the Vitakraft Fresh for sale, you can also select the Carefresh Complete as it is an option worth trying. This bedding is made to keep a fresh smell for up to 14 days. The crumbles in this package are capable of holding 3 times their weight and they offer excellent odor control and thus a clean and dry environment. Because it’s made entirely of recycled paper, this bedding isn’t toxic or bleached. You will rarely find dust particles in this pack. It’s a soft bedding that tends to crumble apart easily. That may cause a mess in some pets’ cages. You can hardly feel a bad odor coming out of your hamster’s cage with this bedding. Due to the fact that this bedding contains no dye, chemicals or clay, it’s a safe one for all pets. To eliminate all microorganisms, including bacteria, mold, and fungus, the manufacturers of this product sanitized it to 380 Fahrenheit degrees. This is a bedding that can absorb 3 times its weight in liquids. It also offers great odor control. The bedding smells great at first but after several days it starts to be unpleasant. This is one of the safest beddings that you can find and it also does well to absorb liquids. This bedding not only creates a clean environment but it also gives the cage a pleasing look. To overcome bad smells for up to ten days, the product benefits from a special Odor Formula. It’s safe for all pets as it’s made entirely from biodegradable and compostable paper fibers. The small pieces can expand to two times their volume. When too wet, the bedding transforms into something like a paste that sticks to everything. Offering enough “fluff” for your hamster, this bedding is good at keeping odors away too. 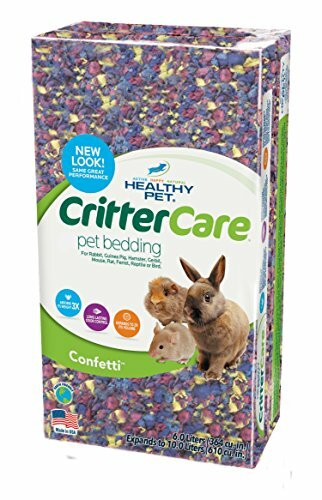 After going through reviews of hamster bedding for odor, reading product specifications and analyzing experts’ opinions, we managed to select a few of the top-rated products in this line, which are showcased below. 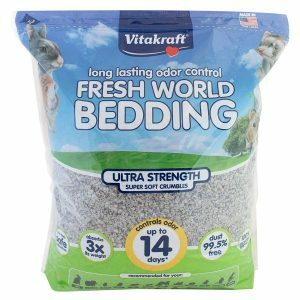 If you want to offer your small pet a great habitat, you should go for specific accessories and high-quality bedding, such as the Vitakraft Fresh. This product will keep your hamster’s cage cleaner and your home smelling fresh for up to 14 days. One of the features of this item is that the crumbles can absorb three times their weight, and provide excellent odor control, maintaining a clean and dry environment. The intensity of smell can vary from one animal to another, so you should check your pet’s cage regularly to keep a healthy and clean setting. Vitakraft’s bedding is unbleached, nontoxic, and made of 100% recycled paper, making it perfectly safe for your small friend, but also for yourself, especially if you are dealing with allergies. Since it is 99.5% dust free, it will create less mess than other similar products, and offer you and your pet a healthy, fresh smelling home. Hamster cages can make excellent additions to any home, especially if they are accessorized with the right stuff. Besides the classic wheels for hamsters and other toys, the bedding is an essential part of the pet’s habitat. 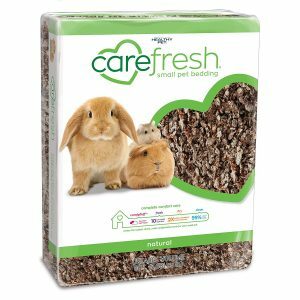 The Carefresh Complete natural pet bedding is an option worth considering. In this line of products, it is one of the safest and healthiest items because there are no dye, clay, ink or chemicals used in the papermaking process. The product is sanitized to 380 Fahrenheit degrees in order to eliminate bacteria, mold or fungus. The bedding can absorb three times its weight in liquids from water bottle leaks and pet waste, ensuring a clean and dry environment for your small animal. Not only this, but the product comes with a great advantage of providing outstanding odor control. Any pet owner knows that having an animal comes with various odors. You will not encounter such an issue with the Carefresh bedding. In case you are searching for great additions for Syrian hamster cages, you should start with high-quality bedding. The one offered by Healthy Pet comes in diverse colors, which will create not only a clean environment but also a visually pleasing one. This product features the Odor Stop formula which has been tested to overcome ammonia odors for even ten days. Moreover, it is made from 100% biodegradable, compostable, sustainable and renewable paper fibers. These can absorb liquids three times their weight, and can also expand two times their volume. This way, you can ensure a dry and warm environment for your small pet. The paper fibers do not fall apart, and they do not stick to the bottom of the cage, due to the unique material and manufacturing process. This product is very easy to clean and maintain, and almost dust free which is a great feature for people with allergies or respiratory issues. 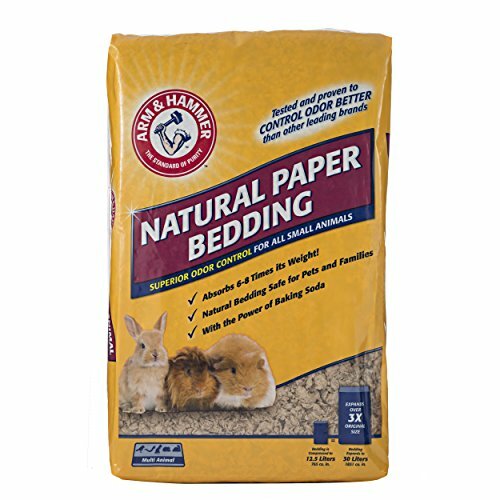 If you want to find a product that is proven to control odor and is suitable for cages for dwarf hamsters, you can consider the Arm & Hammer Natural paper bedding. This is an item dedicated to keeping small animals comfortable, cozy and warm. Your small pet will surely like to roll, hide and play in the soft natural paper bedding. The secret to this product is baking soda which will maintain your home and your pet’s habitat smelling fresh and clean. Just place two to four inches of bedding in the cage; you should decide this according to how many animals it is for. Also, make sure you change it at least once a week. In the meantime, remove the damp spots and soiled areas, and replace them with fresh bedding. This product, made from natural materials does not contain toxins, sludge, or reclaimed pulp, and it is 99.9% dust free, being safe for pets, but also for owners. When you have small animals, you should offer them high-quality hamster treats or suitable ones for each type of pet. However, this is not enough. You should also make sure you ensure that your little friends have good bedding that will make their habitat comfortable and cozy. 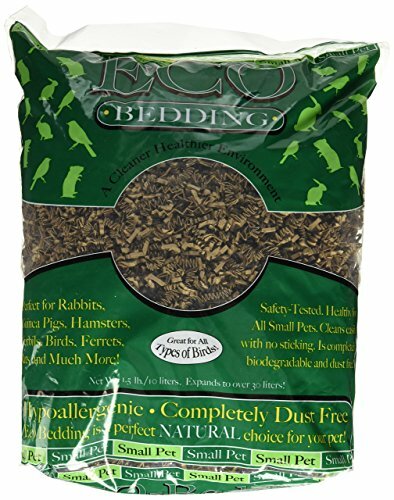 FiberCore comes with a clean, comfortable and healthy bedding specially made for small animals such as hamsters, mice, gerbils, rabbits, or even for birds. This bedding is easy to clean, and it does not stick. It is 100% biodegradable, dust free, and it can expand three times. The paper sources for this product are FSC certified (Forest Stewardship Council), making it environmentally friendly as well. Most customers’ reviews mention a significant aspect for these types of items — the bedding has excellent odor control, and ever since they started using it, they feel a less bad smell around the pets’ homes. Some even stated that they have also noticed less dust and that sore noses are gone. Among the cool things about hamsters is that they like to burrow in order to sleep or to create nests. When having a pet, you should always keep its natural environment in mind, and create a habitat as similar as possible to the one in the wilderness. If you do this, you will have a healthier and happier hamster. One of the key elements to achieving this is the appropriate bedding. You need to find one your small friend can dig around in and turn into a nest. There are, however, a few other aspects to consider when purchasing the right type of bedding. When selecting the product for your pet, try not to go for cheap odor control bedding for hamsters, but rather look for the materials it is made of. Unfortunately, there are many items in this line which are totally unsuitable. For example, try to avoid pine and cedar wood shavings, as they can be abrasive and also splinter into sharp pieces. This can lead to injuries for your hamster and even infections. Moreover, these shavings can react to urine and generate toxic fumes that can harm your pet’s breathing. You should also stay away from the so-called fluffy bedding, which is made from artificial fibers and cannot be digested by small rodents. Other examples of what you should not buy are cat litter, corn cob, newspaper, and any scented bedding. Now that we’ve gone through materials that must be avoided, we should also look at what you can use for a good hamster bedding for odor. Cellulose fiber is a great element in this line of products, as it is designed to soak up its weight in liquids multiple times. This makes it less smelling, and easier for you to clean. There are other beddings made from plant-based paper fibers, which is also a healthy option. Aspen shavings can also be considered. If you want to create a healthy, but also eye-catching habitat for your hamster, you can choose colored bedding. Various products come in different colors, designed to brighten the pet’s home. If you decide on this option, make sure that only pet-safe dye has been used. Although many products promise they will keep a fresh smell for multiple days, this really depends on the type and size of your pet, and also on their numbers. 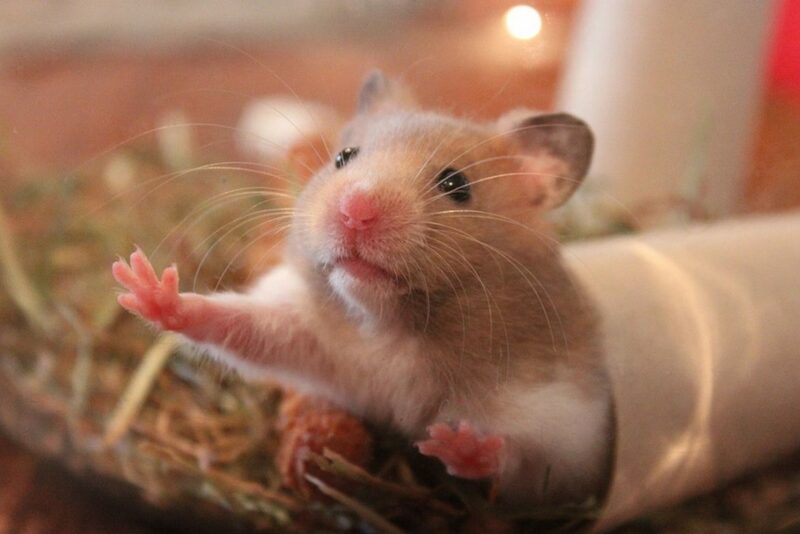 If you have a habitat with three Syrian hamsters, for example, the odor will kick in faster than from one dwarf hamster. When selecting the product, you should carefully go through customer reviews, but, as mentioned, the experience can differ, depending on the aspects previously stated. To avoid this issue, make sure you check your pet’s bedding every day, clean up any wet spots and add some new one, and, if you detect any bad odor, change the bedding entirely. Another important thing you should do is to clean the base of the cage, as well. If you want to ensure the well-being of your small pet, you will not go wrong if you follow our tips. Also, you can look for the right foods for hamsters which will make your little friend happy.